Adi Gallia was a great pilot and skilled warrior. Gallia had a unique and unorthodox reverse one handed grip on her lightsaber. She was a tall human female, who had an exotic beauty and wore an odd headdress draped with tentacles. Adi was the daughter of high-ranking Corellian diplomats, giving her an ability to junderstand Republic politics at a young age. Her network of contacts informed her of suspicious Trade Federation activity in outer systems. She then warned Supreme Chancellor Valorum, who eventually sent two jedi to deal with the Naboo blockade. Adi Gallia highly respected Jedi Master Even Piell. Piel had saved Gallia's parents from a terrorist strike on the system of Lannik, years ago. Following the Battle of Naboo, Gallia and Piel, plus several other Jedi Council members, were sent to Malastare to discuss peace talks with terrorists and Lannik representatives. Gallia was a member of the Jedi Council during the waning days of the Republic. 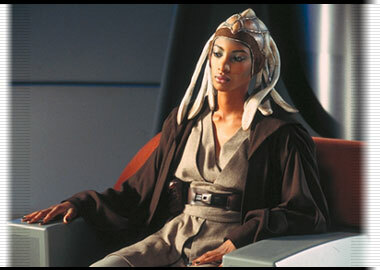 She served on the Council when Qui-Gon Jinn brought Anakin Skywalker before them and was also fighting with the Jedi in the Battle of Geonosis.